Dr Andy Galpin performing a dead lift. Dr Andy Galpin (Instagram and Twitter) has a degree in exercise science, a masters in Human Movement Sciences and a PhD in Human Bioenergetics (studying the structure and function of human skeletal muscle at the single cell level), This also resulted in the opening of the Biochemistry and Molecular Exercise Physiology Laboratory (BMEP) at CSU Fullerton. The BMEP lab studies the acute responses and chronic adaptations of human skeletal muscle in response to high force, velocity, power and fatiguing exercise from the whole body, down to the individual muscle fiber and even into the individual DNA. The team does this by taking muscle biopsies from non-athletes and elite athletes from different backgrounds (e.g. normal college student, MMA fighter, Boxer, Weightlifter, etc.) and use highly sophisticated laboratory techniques and equipment to address questions about single fiber “type”, size, function, protein quantity, diameter, mitochondria, and myonuclear function. I really enjoyed Andy Galpin’s interview on The Joe Rogan Experience which led me to ask him on to Corporate Warrior. Every now and again, I like to invite someone on to the show who isn’t from a HIT background and has a different opinion on what exercise is the most effective for various desirable outcomes. Whilst Andy does believe that HIT provides some value, he believes that traditional high intensity training falls short in meeting all of the requirements for optimising health, longevity and even muscle gain. QUESTION(S) OF THE DAY: What do you think are the downsides of HIT? Please let me know in the comments. Hi Lawrence, Big thanks to You, again for your great job and effort to bring fair, sensible and useful information and discussion on all topics and aspects of exercise an science! Listening at the last several podcasts, I’d like to share some of my conclusions both theoretical and practical application changes from my personal perspective and my personal way of training. 1. It is not necessary to do each exercise for each muscle group every workout. Important is to do all the necessary planes of loading (say chest and back) at some point, needed are exercises for all major muscle groups at least, but it is not necessary every time you do back for example do both chins, rows, ext’s etc. Same goes for week 2 and so on…. Thank you for posting this Kamen. This is really useful :D.
I think that many of the “bases” that Andy feels aren’t covered actually fall under the umbrella of “skills” and that isn’t something that BBS style protocols seek to address. Correctly performing BBS type work outs in themselves require quite a lot of neuro-muscular adaptations or “skill acquisition” to consistently perform correctly, they do provide some carry over to “general” speed and power but things like foot speed and jumping height etc are skills unto themselves. For example, I have found concentrating on training the muscle groups associated with running have improved my running speed etc whilst providing a host of other positive adaptations but the actual skill of running needs to be built by carrying out the specific act itself. 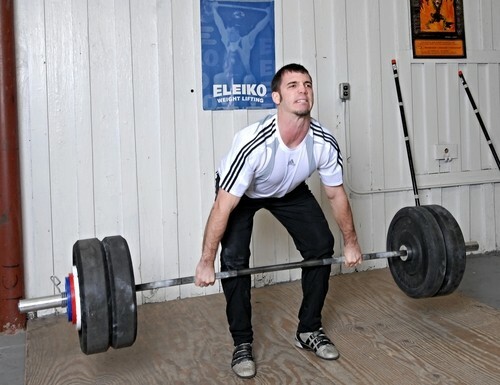 Gait, specific exercise efficiency, foot strike etc are running specific skills, the same goes for all specific sports/recreation, even strength related endeavors like Olympic lifts etc, HIT will only get you so far without skill training. I think it’s easy to conflate the two. Hey, just a follow up on my post above. I’ve recently been hitting the 10km runs again regularly along with considerably upping my walking etc and it is paying off regarding breaking a weight loss plateau. Again I must though emphasise extreme self discipline regarding diet. It’s easy to forget that a lot of folk will stare at a treadmill readout for “calories burned” at the gym and figure they deserve their Starbucks on the way home. I’ll run a 10k in the morning, fasted and not eat again until 6pm and it’s not even that hard, maybe i’ve nailed that “fat adaptation” thing? Maybe. Still doing strength training too? I recently interviewed Dr Wayne Westcott who explained that some people will burn 9 calories per pound of muscle per day 3 days after strength training. If you workout twice a week, that will last the entire week. Over several pounds, this is not an insignificant number of overall calories burned. Can’t outwork a bad diet but RT certainly makes it more permissive. And perhaps you additional activity is burning cals / emphasising a signal to increase EE/shed more fat? Oh yes of course, resistance training is my number one priority for body composition. I’m on a pretty heavy calorie deficit at the moment so I’m down to a big three once a week to cope with recovery better. Managing to maintain mass and even make marginal gains in TUL some weeks. 1. Acc. to me, one has to be very concentrated and knowledgeable in order to make best use of HIT OR to have a trainer/parthner to guide/supervise him during sessions. After so many years of training I still need to remind myself almost everytime when entering the gym, what is the real objective of exercise, what is good form and what is necessary effort. Fact is, that HIT is very hard to be practiced by majority of people on their own, as far as form and effort is concerned. So in other words less is more BUT only if understood and done right. And of course it makes little sense, to use pure HIT if you’re juiced anyway. So this discrepancy kind of falls in the “downsides”cathegory of the HIT method, at least as public eye is concerned. Nice points. Any downsides in the pursuit of health / physical fitness? So what better validation of HIT than that – real life?! One “downside” I have noticed is what is colloquially referred to as “awakening the active genotype” I work at a desk all day and since starting training, as the weeks and months have gone by it’s getting harder and harder to sit still all day. On a sunday I can hoe weeds and dig at the allotment for hours with enthusiasm but day to day sat here I just want to get up and move around! That should be a plus but even with regular “movement breaks” I’m finding it a struggle. It’s genuinely concerning that I now struggle to cope with the sedentary aspect of my job, I’m loathe to pack it in and embark on a new career! Hahah we call that a high quality problem. You have to find a way to introduce more movement or, like you say, get a new career ???? I’ve developed a series of light and brief movements that I can do in my (home) office which is starting to alleviate “the itch” so to speak, evry half hour I’ll get up and spend 2-3 minutes on a specific thing before returning to my desk. BBS style HIT and serious bodybuilding are two very different things and shouldn’t be conflated imo. In the first you do the minimum necessary to grow. The latter requires doing the most possible while still recovering. Kamen, your first point is a huge limitation in that it virtually requires having a trainer for most people, and most people will not get a trainer. For those training without a trainer, using a somewhat higher volume and frequency with less intensity might be a better approach. Hi Thomas, I hope that I am understood correctly. What I mean as point one, is actually valid for all training programs or protocols. The effort put in the exercises, keeping best form etc. requires serious mental focus. It is hard to be consistent, at least for majority of people. My experience shows this 100%. It is always better if you have being supported or supervised by a knowedgeable partner or trainer. I meant that if you train alone, it only makes it much more challenging to stay focused on your real objectives. I’ve trained many peple myself and almost every time workout with me is by FAR better, compared to their sessions alone. Regarding HIT in particular, for many folks it seems that one set will do instead of 5 end of story. But that obviously is not the case. And in this sense, there is constant trend in my opinion to adapt to something (exercise, routine etc. ), even on subconscious level. For example if you are constantly looking for improvement of TUL/Weight, you are setting yourself up for failing your main objective – to train with max effort, but in best possible form, without deloading muscle, sand bagging …so forth. And this often happens unnoticed by the trainee, despite best intentions. That’s why I keep repeating myself some advise, I’ve got from experts on this podcast – Let the increase of TUL/Weight be a side effect, rather than persuated outcome of an execise (Dr. Mc Guff); Be honest with yourself (David Landau); Do various exercises (perfect form and full effort), so you will not have to bother each time about improving the weight/tul performance on a given exercise (Brian Johnston interview) and still get a great workout. Kamen, modern HIT dogma has taken the importance of rep performance to new heights (and thus the most extreme modern iterations of “the real objective”) making having a trainer with special equipment almost a necessity. The rules are therefore written and tend to be defended by referring back to those rules, not evidence. Minus certain circumstances, the hyper-focus on rep performance is overkill imo. Thomas, never meant to sound dogmatic, emphasis is not on trainer,neither on special equipment… Fact is though, that most people are largely ignorant about rep technique, muscle strenght curves, range of motion, joint and muscle function and exercise selection, recovery… I train alone 99% of the time, I have been training with weights for over 20 years and am not a trainer, but I recognise how things get sloppy very fast and that everybody can use some good explanation, advise, supervision. To learn and understand, to be able to and to actually practice something are three different things. Kind of lost me with stating bbs wouldn’t train power or speed. But the more frequency but less intensity is food for thought. I get calluses from playing guitar frequently. And I tan from frequent sun. (Remember Mentzer analogy for calluses or sunburns). Volume, frequency and intensity. HIT emphasizes intensity while deemphasizing the other two. Perhaps varying means changing that up. In investing, a parralel might be potential return vs volatility vs liquidity. In both case you can’t have all 3, so you choose what to emphasize based on your goals and or just to mix it up. Nice analogy Richard thanks for the comment! And sharing all of my stuff a bizzilion times ???? Hi Andy/ Lawrence, Great interview – some really useful practical points raised. Just curious on one point though: you called out Brad Schoenfeld for being ‘short-sighted’ for not stating that nutrient timing is most certainly crucial after fasting – but from the discussion section from his paper which you link to, Brad and Alan write: “Despite claims that immediate post-exercise nutritional intake is essential to maximize hypertrophic gains, evidence-based support for such an “anabolic window of opportunity” is far from definitive. The hypothesis is based largely on the pre-supposition that training is carried out in a fasted state. During fasted exercise, a concomitant increase in muscle protein breakdown causes the pre-exercise net negative amino acid balance to persist in the post-exercise period despite training-induced increases in muscle protein synthesis . Thus, in the case of resistance training after an overnight fast, it would make sense to provide immediate nutritional intervention–ideally in the form of a combination of protein and carbohydrate–for the purposes of promoting muscle protein synthesis and reducing proteolysis, thereby switching a net catabolic state into an anabolic one. Over a chronic period, this tactic could conceivably lead cumulatively to an increased rate of gains in muscle mass.” To be honest, it is a bit difficult to miss that, so I was wondering why you made the point stating the opposite? Well spotted Rob. Very thorough. I’ll ask Andy to respond but no promises. He’s a busy lad! Have you heard of the Boise experiment. Its basically two guys following Mike Mentzer’s latest book for 60 days. Results were pretty impressive and they documented each day. Nice job, LN, with this interview. I haven’t listened to all of your interviews (especially lately, there’s so many) but Dr. Galpin might have been the most antagonistic sounding interview you’ve done. Having said that, great interview with some very good info. It’s great to get someone else in there to break down some of the HIT dogma. With that, I am positive that most people do HIT because it is very doable for the average person, not because it delivers the absolute best results. Essentially, it’s good enough for most/reasonable return on investment. Hey Thomas, thank you, indeed I think it’s important to speak with people outside of HIT to get a broader view on exercise. Personally, I am yet to hear an argument that suggests HIT is less than optimal for most desirable outcomes. Although increasing frequency so long as volume per session is low and resistance is moderate, may improve results based on the literature that Dr James Steele and I discussed here: https://highintensitybusiness.com/podcast/james-steele-maximizing-muscle-gain/. Great episode. It’s nice to hear different opinion raising issues not thought of before such as foot speed!